It’s no secret to those that know me that I love denim, I’ve always been a blue jean girl. It’s basically all I wore in high school. Now that I live and work full time on the ranch, the only time you’ll see me in anything but denim is on Sunday morning in the church pew. We go through lots of denim whether our grungy chute-side work clothes, our nicer meeting-customers work clothes and even our out-&-about play clothes. Even when it wears out I hate to throw away that beautiful dungaree cloth. It’s so beautiful & heavy and it begs for another purpose. It’s a great way to support this blog so RancherMan & I THANK YOU! Recently RancherMan wore though the knees of another pair of his Wrangler jeans. Now I may be the only wife in the world who gets happy when her hubby wears out the knees of his jeans. When he does I always make drink coasters out of his worn jeans! There’s just something about that authentic cattle-rancher patina, the worn places where he keeps his pocket knife in one pocket & his cowboy wallet in the other as he goes about his daily chores. It’s so real, so rustic! To make these coasters I cut a pocket off, leaving a small flap on top. We enjoy iced tea and the condensation on the glass always creates a mess. So I cut a thick waterproof plastic sheet to the exact size to fit inside these pocket coasters. I slide it into the pocket so any moisture would stop after that first layer of cloth. I tuck the top flap back in and give it a little ironing to crease it. Sometimes I’ll add a little hot glue to the flap. Now I’ve got brand new coasters. IN DENIM! I love them. And I didn’t sew anything. Not one stitch. I love these, and I have them all over our home. There’s one on the nightstand for morning coffee, a couple on the end tables for iced tea, and even one at each place setting at our dining room table. This entry was posted in Blog Posts and tagged Environment, Frugality, Make-It-Yourself on June 20, 2013 by Texas Homesteader. Very clever upcycle for old jeans! Thanks for sharing at Merry Monday! What a great way to repurpose denim! Thanks for sharing on Simply Natural Saturdays! What a fun idea! I love that it’s no-sew. Even though I know how to sew, I realize many others don’t and don’t have the time to sew, which is what makes and idea like this great. It gives the denim another purpose so it isn’t tossed out! What a fantastic idea! I love that I don’t have to sew to make these. I’m like you and don’t/can’t really sew. Don’t worry I’ve got a sewing machine in case I ever get the urge to try, but Hubby has used it far more than I ever have. 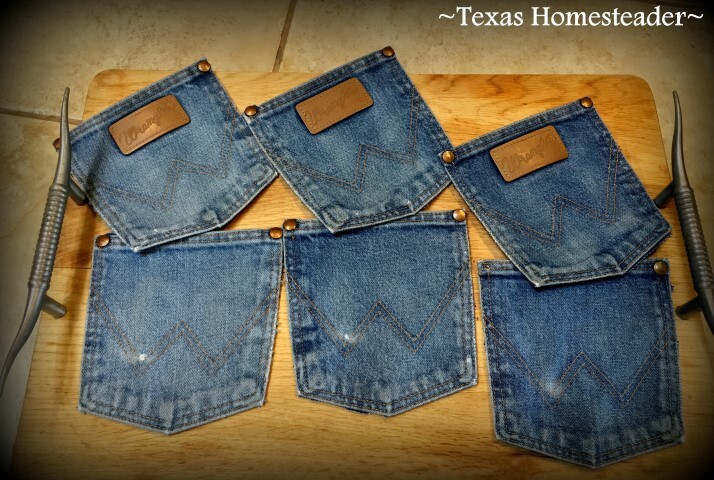 This makes me want to go see if I can scoop up some old denim from a thrift store to make these. Thanks for posting on the #sustainablesunday link up! I love these. And to think I just threw away a pair of jeans that had a big rip in the crotch, darn it! I held on to them for the longest time, but just couldn’t think of an easy way to repurpose them. Thank you for sharing on the Homestead Blog Hop. What a cute idea!! Thanks for sharing on My 2 Favorite Things on Thursday – Link Party!! Hope to see you again tomorrow!! Pinned! Very creative, clever, and resourceful. I’m not much of a sewer either. Thanks for sharing! So simple! So useful! And it never even occurred to me . . . THANK YOU!!! Oh. My. Goodness. You are so incredibly creative!!! This is a fantastic idea. I will never throw away another pair of jeans. 🙂 Visiting from Thursday Favorite Things. Love it! Now I know what to do with all my boys’ jeans that are too torn up to pass down. Thanks for sharing with Simple Lives Thursday! Hope to see you again this week. I’ve always wanted to make me one of them jean purses but it’s just one of them things that I didn’t get around tuit but I have made me an apron from an old pair of black colored jeans. I’m still using my old sewing machine that hubby got for my birthday the first year we where married; 45 years ago last month. Great idea. Great re-use. I am here in Texas too. Nice to meet you neighbor. Great idea! For some reason I really like coasters, not because I’m all that worried about my old furniture, I just think they’re cute! Hi Tammy! I was wondering if you wouldn’t mind me including a link to this post in a round up of Christmas gifts I was wanting to put together. These look like they would be easy to make. This is such a great idea and good use for denim. I definitely think they are adorable, and we already know they will hold up to what you put it through. 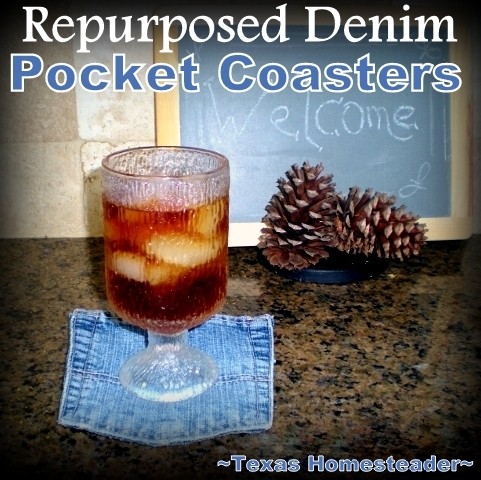 I love all kinds of re-purposing and denim coasters is really a cute idea! Great idea. I’m pinning and I am a new follower. Very clever to put plastic in the pocket to stop the water from going through. I love no sew anything. I may have to blog about my no sew sailor costume. Such a cute and easy idea! My neighbor takes all of our old denim and makes quilts, but I think she throws away the pockets! I will have to keep the pockets from now on. Thanks for the idea! Your post is the featured post at this weeks Making a Home – Homemaking Linky! Thanks for linking up! I love this idea and will be making some shortly. Very cute! Thank you for linking up at Wildrafting Wednesday. What a creative and fantastic idea! Wow! Good for you ~ Great photo too! This would be especially nice for the patio or deck and you could set your patio table with bandanna napkins and have lanterns for table lighting. There’s so much you could do with this. I think it is so funny that we both have a post about this! I guess “great minds think alike” : ) What can I say…great idea! ha! Great and ez idea! My dad uses a denim pocket to store a magnifying glass so it won’t get scratched in a desk drawer.